Infantri British bersiap sedia di benteng guni pasir berhampiran El Alamein, 17 Julai 1942. Pertempuran El Alamein Pertama (1–27 Julai 1942) adalah satu pertempuran Kempen Gurun Barat dalam Perang Dunia II, yang berperang di Mesir antara Tentera Darat Panzer Afrika (Panzerarmee Afrika, merangkumi Kor Afrika) (Fil Marsyal (Generalfeldmarschall) Erwin Rommel) dari tentera Paksi (Jerman dan Itali) dan Tentera Darat Kelapan (Jeneral Claude Auchinleck) dari tentera Bersekutu (Imperial British dan Komanwel) (Britain, India British, Australia, Afrika Selatan dan New Zealand). Pihak British menghalang kemaraan kedua tentera Paksi kedalam Mesir. Kedudukan tentera Paksi berhampiran El Alamein, hanya 66 batu (106 km) dari Iskandariah, dekat dengan pelabuhan dan bandar-bandar Mesir, fasiliti pangkalan tentera komanwel dan Terusan Suez. Bagaimanapun, tentera Paksi terlalu jauh dari pangkalan mereka di Tripoli, Libya untuk kekal lama di El Alamein, yang membawa kedua-dua belah pihak untuk mengumpul bekalan bagi serangan seterusnya, dibatasi kekangan masa dan jarak. Alanbrooke, Field Marshal Lord (2002) . Danchev, Alex; Todman, Daniel, para penyunting. War Diaries 1939–1945 (edisi rev.). London: Phoenix Press. ISBN 1-84212-526-5. Barr, Niall (2005) . Pendulum of War: The Three Battles of El Alamein. London: Pimlico. ISBN 0-7126-6827-6. Bates, Peter (1992). Dance of War: The Story of the Battle of Egypt. London: Leo Cooper. ISBN 0-85052-453-9. Bharucha, P. C.; Prasad, Bisheshwar (1956). The North African Campaign, 1940–43. Official History of the Indian Armed Forces in the Second World War, 1939–45. Delhi: Combined Inter-Services Historical Section, India & Pakistan. OCLC 563270. Caccia Dominioni de Sillavengo, Paolo (1966). Alamein 1933–1962: An Italian Story. Allen & Unwin. OCLC 2188258. Clifford, Alexander (1943). Three Against Rommel: The Campaigns of Wavell, Auchinleck and Alexander. London: George G. Harrap. OCLC 10426023. Gannon, James (2002) . Stealing Secrets, Telling Lies: How Spies and Codebreakers Helped Shape the Twentieth Century. Washington DC: Brassey. ISBN 1-57488-473-5. Hinsley, F. H.; Thomas, E. E.; Ransom, C. F. G.; Knight, R. C. (1981). British Intelligence in the Second World War. Its Influence on Strategy and Operations. II. London: HMSO. ISBN 0-11-630934-2. Johnston, Mark (2000). Fighting the Enemy: Australian Soldiers and their Adversaries in World War II. London: Cambridge University Press. ISBN 0-521-78222-8. Johnston, Mark; Stanley, Peter (2002). Alamein: The Australian Story. South Melbourne, Victoria: Oxford University Press. ISBN 0-19-551630-3. Johnston, Mark (2003). That Magnificent 9th: An Illustrated History of the 9th Australian Division. Crows Nest, N.S.W. : Allen & Unwin. ISBN 1-86508-654-1. Lanza, Colonel Conrad H. "Perimeters in Paragraphs: The Axis Invades Egypt" (PDF). The Field Artillery Journal. Fort Sill, OK: Field Artillery Association (September 1942). ISSN 0191-975X. Latimer, Jon (2002). Alamein. London: John Murray. ISBN 0-7195-6203-1. Lewin, Ronald (1977). The Life and Death of the Afrika Korps: A Biography. Batsford. ISBN 0-71340-685-2. Mackenzie, Compton (1951). Eastern Epic: September 1939 – March 1943, Defense. I. London: Chatto & Windus. OCLC 1412578. Maughan, Barton (1966). Tobruk and El Alamein. Official History of Australia in the Second World War. III. Canberra: Australian War Memorial. OCLC 954993. Playfair, Major-General I. S. O.; with Flynn RN, Captain F. C.; Molony, Brigadier C. J. C. & Gleave, Group Captain T. P. (2004) [1st. pub. HMSO 1960]. Butler, J. R. M., penyunting. The Mediterranean and Middle East: British Fortunes reach their Lowest Ebb (September 1941 to September 1942). History of the Second World War United Kingdom Military Series. III. Naval & Military Press. ISBN 1-84574-067-X. Rommel, Erwin; Pimlott, John (1994). Rommel: In His Own Words. London: Greenhill Books. ISBN 978-1-85367-185-2. Scoullar, J. L. (1955). Kippenberger, Howard, penyunting. The Battle for Egypt: The Summer of 1942. The Official History of New Zealand in the Second World War, 1939–1945 (edisi online). Wellington: Historical Publications Branch. OCLC 2999615. Dicapai 2 November 2007. Stewart, Adrian (2002). The Early Battles of Eighth Army: 'Crusader' to the Alamein Line 1941–1942. Barnsley, South Yorkshire: Leo Cooper. ISBN 0-85052-851-8. Watson, Bruce Allen (2007) . Exit Rommel. Mechanicsburg PA: Stackpole Books. ISBN 978-0-8117-3381-6. 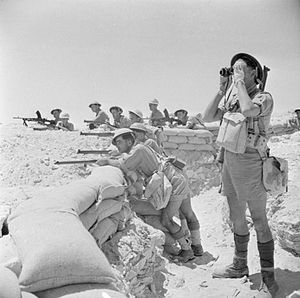 First Battle of El Alamein, from Italian "Comando Supremo"
Laman ini diubah buat kali terakhir pada 06:58, 17 Disember 2017.